Look back on yesteryears, during the first few years of the millennium, when the prevalent social media websites were MySpace, Friendster, Multiply, and LinkedIn. They were mostly for personal connections as people used them to interact with friends and relatives from faraway places. A few years after, Facebook, Twitter, Instagram, and other online platforms came into play. People migrated over to them, gaining these sites millions of users. Then, someone came up with the idea of a business creating a business account, connecting with people, and marketing to them. It worked. The rest, as they say, is history. How did it work though? Two words: visual content. “What is visual content?” you ask. In a nutshell, visual content are pieces of information that are seen instead of read—thus, the beginnings of visual content marketing. This type of marketing is common today. Forty percent of people respond better to visual information than text. It’s no secret that images are easier to digest than writings. Subconsciously, they would rather take a few seconds to look at a picture than spend a longer time to read a wall of text. This is why visual content is slowly taking over the marketing scene. Since it’s easier for marketers to interact with customers through images, the former have incorporated techniques involving visual content to enhance and solidify their strategies. Especially when social media platforms are concerned, proper implementation of strategies means higher customer interaction, conversion, and retention. Doesn’t that sound beneficial for your business? It sure was for companies that executed it precisely and neatly, like Starbucks and Dunkin Donuts. Their strategies were all about their brands and how they want to be perceived. This effort to make their brand familiar and relatable translated well for their success. Social media platforms are a big help, of course. This is the closest you can get to your target audience—instead of them going to you. By relying not only on your company website but also on Facebook, Instagram, and/or Twitter, you spread your word to your audience; they, in turn, share to their connections. This ability is called “shareability.” When your posts are too great not to pass up to share, they will reach people you never even intended—or even expected—to know about you. Certainly! You already know what that is by definition. How can you maximize it? There are lots of avenues; social media isn’t the only one. Your company website and blog should have visual appeal to it. You wouldn’t want your official business pages to be ignored, right? 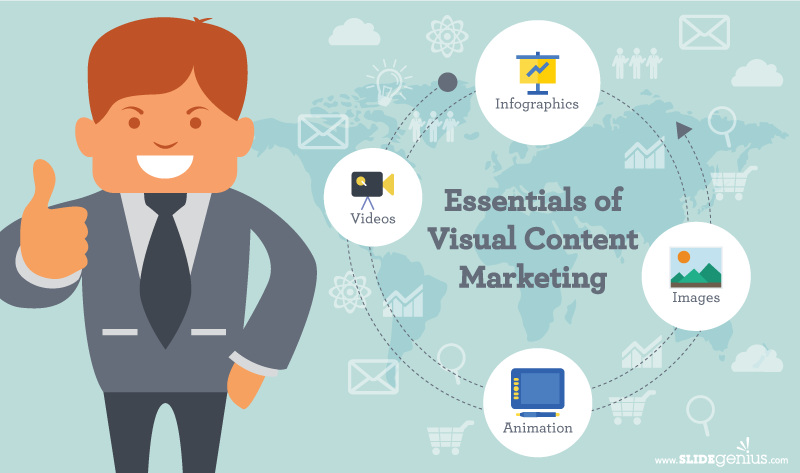 Visual content isn’t limited to social media platforms. Unless you want to have a richer Facebook timeline than your own site, then create content for other pages as well. Easier said than done, though. Creating a shareable post takes creative effort. It’s not something you can do willy-nilly and expect people to just gobble up. Your posts should be: first of all, good and well thought of; secondly, relatable; and lastly, interesting. This is a point that you should not ignore. Using an infographic doesn’t guarantee shareability. You’re asking one of the basic questions now. First off, you should get creative. A great post is shareable. Be creative with your image. There are several design techniques to do this, be it an infographic or a picture with embedded text. It boils down to your creative juices; and as they say, “The sky’s the limit.” If you’re not that confident about your artistic senses, then you can have visual artists do it. Also, you still need to market your visual content. Just because you posted it doesn’t mean it will be shared instantly—and even if that happens, it occurs very rarely. Give your post a call to action. Aim to inspire your readers to do more than just sharing. Make your post an experience. That way, it won’t just be about the sharing; people can say that you and your post directly affected their lives in one way or another. If executed properly, yes. Of course, there’s more to it for you. You reach out to your target market and get potential customers. That means conversion rates. You also get to connect with your customers, and they think better of you. That’s a plus for your reputation. When your reputation is good, then this cycles back to potential customers—since there’s already proof from other customers that your company is that good. This also leads to “top of mind awareness.” People remember you easily resulting to more customers. It’s a whole cycle of benefits. Whoa indeed! Now that you see how beneficial a proper visual content marketing strategy is, you would want to take that action. It may and can be difficult, but the rewards are worth it. While there’s some risk involved, there’s nothing much for you to lose, but so much for you to gain. So what are you waiting for? It’s time to get creative!